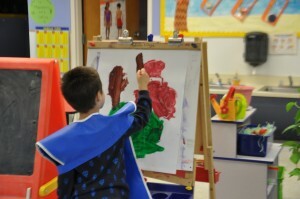 Art and preschool go together like peanut butter and jelly. It’s not likely that you’d find a daycare or preschool that doesn’t encourage their students to spend a good portion of their day engaging in one form of art or another. And for good reason. Though it mimics playtime in a variety of ways, kids who participate in art creation are actually putting their brains and bodies to hard work. Art activities are so intrinsically tied to our childhoods that it seems to be their forte rather than an adults. After all, when was the last time you picked up a coloring book and just happily sat quietly filling in the lines with your favorite hues? But because it is so natural for kids to get artsy, almost without urging, that we forget that there are components to the activities that spur emotional, cognitive and motor development. By allowing the full use of materials and media, art creation gives preschoolers the opportunity to express themselves, make their own decisions and to control the outcome. This leads to an increase in self-awareness and esteem while children begin to get feedback from others. Team activities help to increase a child’s ability to learn skills such as teamwork and sharing. By giving a child the opportunity to explore through arrangement, perspective and color, they build upon their young cognitive skills. By having to make certain decisions about their own art – including what to portray, what medium they will use, their arrangement and the perspective – those skills are built exponentially and help increase the ability to rely on their own methods of making those decisions. Finally, by using differing body parts to create a variety of art objects, these creative endeavors help children to learn how to manipulate their fingers, hands and so on to achieve the results they were hoping for. Where drawing and painting require movements that build strength and coordination, cutting, pasting and manipulating materials help to increase eye-hand coordination and develop fine motor dexterity. At any of our preschools in Milldale, South Windsor and Glastonbury, you’ll find students of all ages engaged in a variety of art projects on a daily basis. We believe in the fun and function of art in all its forms and encourage children to always get artsy with their play, and to play with their art.